A single solar cell is available for around 70p (now 94p – gone up since this article was written! ), a viable price for key stage 3 projects if only one is required but too expensive if 8 cells are needed. What we really need is a way of stepping up the voltage of a single solar cell (0.5V) to 4V to drive the LED. 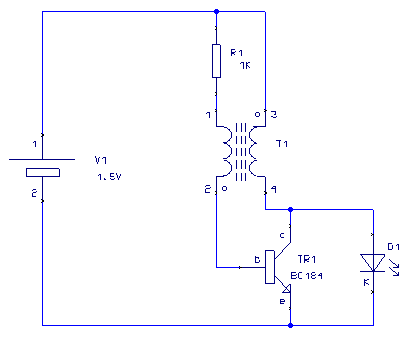 Such a circuit exists – it is a simple switched-mode power supply (see fig 1). This little gem of a circuit goes by the nickname of ‘joule thief’. The ‘joule thief’ circuit shown in fig 1 is a valuable circuit as it stands because it can be powered by batteries that would otherwise be considered expended. Most battery powered consumer products fail to operate properly when their battery terminal voltage falls to about 2/3 of their voltage when new. When the terminal voltage of cell drops from 1.5V down to 1V it still contains up to half of its original chemical energy (depending on the rate at which it was discharged) which the ‘joule thief’ can ‘steal’. An LED can be powered at full brightness from a ‘flat’ battery (cell) for many hours until the terminal voltage of the power supply falls to around 0.35V.